Hello readers! 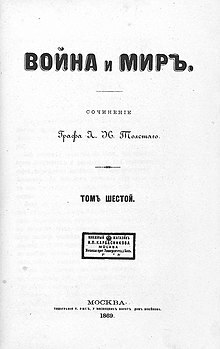 How many of you have read the novel War and Peace by Leo Tolstoy? I have tried reading it time and again but could never read more than 50 pages in a blow. Why? In this 21st century that we live in, the novel seems irrelevant, boring and highly unusual. It might have stood up to the test and taste of Leo Tolstoy's time but today, certainly, it does not make any sense. I am not against the prejudice of reading and boasting to have read a 'classic'. However, I am just stating my opinion that I could not excite myself enough by the content of this piece called War and Peace. I would love to have your opinions. Thanks! There are certain things in this world that is not as good as it looks rather we are compelled to do this due to certain outer pressure. War and peace is one of those work that is a kind of hype create by some intellectual readers out there who have not read yet it again. War and Peace is a volumes novel that is not easy for any reader to digest completely. Your brain is not trained enough to remember thousand characters and connects it all the time with the story. I don't know why people are giving much importance to this novel. It is a bit too harsh to call a legendary novel like War and Peace as a not worthy novel. You have suggested that readers do not have enough patience to hold it till the last. That's why the novel is meant for only serious readers. If you talk about the book in general then certainly it si the best novel ever written. But if you ask the relevance of this novel in contemporary world then certainly it does not hold the good. People do not have enough time to read this volumes novel. Moreover, there is no any situation like this in the world. so, no body will bother about reading this masterpiece. You are true in your words Ratan. Most of the scholars have just created a hype that these are classic novel and you must read it. If you ask them to speak honest, have they read it? Answer will be no. Because most of the readers like us are just listening about these book but in reality no one has ever read it. War and Peace is an evergreen novel that has changed the way of literary writing. He has managed more than thousand characters in a pretty good way. Current time: 04-19-2019, 04:08 PM Powered By MyBB, © 2002-2019 MyBB Group.